Whenever I can’t leave town, but I want to escape the Renaissance Disneyland that Florence has become, I go to Paperback Exchange to hide out for an hour or two. Established almost 30 years ago as a second-hand, trade-in, English bookshop, Paperback Exchange began life as a tiny store, on a busy, dusty corner, crammed with jumbled piles of books. In 2005, Maurizio and Emily moved the shop to a tranquil street in the heart of the city, less than a block from the Duomo. The new place has two expansive rooms with large windows, comfortable reading chairs and well-organized shelves. It has a welcoming, cozy atmosphere and is a lovely place to browse, read or hang out and chat. 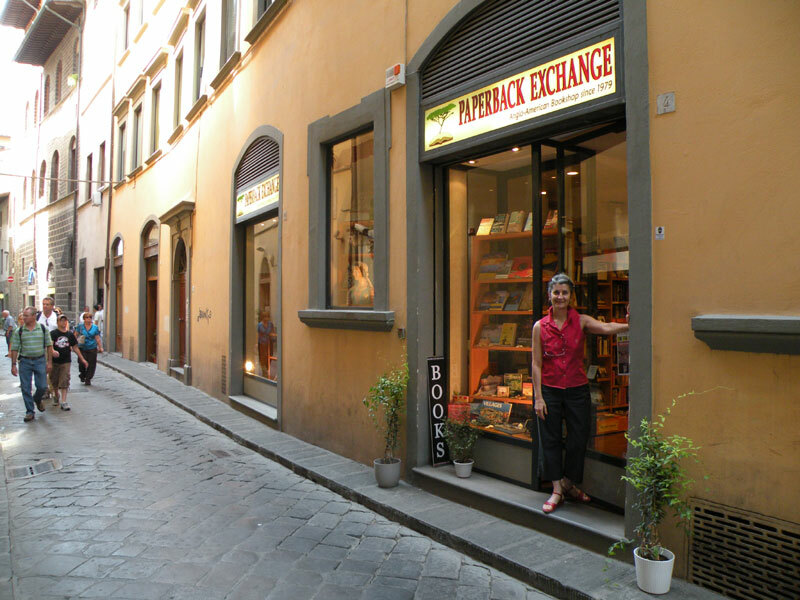 Paperback Exchange has evolved over the years into not only a well-known and respected independent bookstore, but also has become a focal point for the English-speaking community in Florence. The store holds regular events, such as poetry readings, literary discussions and a children’s story hour. Today, Paperback Exchange stocks thousands of new and used paperback and hardback titles while still continuing to welcome trade-ins. It is also the “campus bookstore” for the North American universities in Florence and central Italy. For the tourist, Paperback Exchange is a prime destination to find travel guides and new or used books for the road, as well as a spot to lighten a suitcase by trading in those books that are no longer wanted. The friendly staff is always ready with reading advice and even helpful directions to the “best” Florence has to offer, be it a restaurant, panoramic view, museum or shop. Libreria molto bella, accogliente. L’unica a Firenze del genere, la formula e’ vincente. Alto il prezzo dei libri. D’altronde ordinando su Amazon te li fermano alla dogana. Siamo in Italia. Again. No choice!